Amy's Creative Pursuits: "I Get My Style From Glamma!" Shopping for little girls is so much fun! I think I enjoy shopping for clothes for my granddaughter more than myself. There are so many cute things out there for little children it's hard to resist. I have the feeling Alethea will be the best dressed baby everywhere she goes because I have no willpower when it comes to this little one! I spotted this graphic bodysuit while shopping for Christmas presents for Alethea and I knew it just had to go into my cart! I wasn't sure Ashley or Jason would appreciate it, but I thought it was so perfect; and if they didn't like it, I would at least get a cute photo shoot out of it, and I DID! Is she just the cutest thing or what? Just look at those BEAUTIFUL big blue eyes! She's a doll to photograph too! She's always so expressive and gives us just gorgeous, big smiles! As always, we coordinated our outfits. 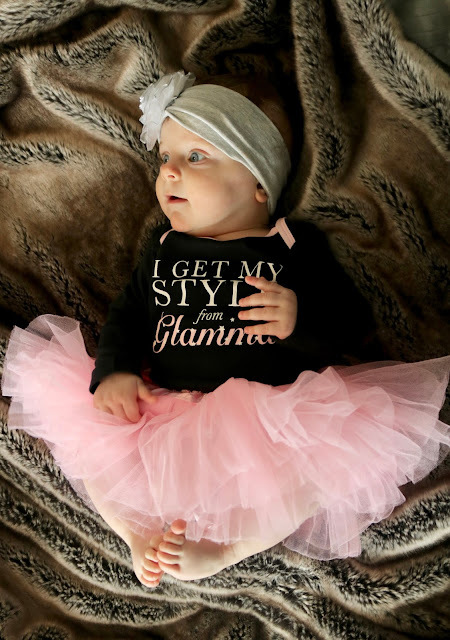 Alethea is wearing her Stylish Glamma Collectible Bodysuit from Carters with a bright pink tutu, and a grey knit headband (Macy's). I am wearing a black peplum top with black dress pants (both from JCP and old) and black suede wedges (Famous Footwear, old). I added a pink pearl necklace and a pink stone bracelet to coordinate with all the pink in Alethea's outfit. Ashley and Jason ended up thinking the bodysuit was pretty cute. She actually gets a lot of use out of it because it has long sleeves and it works as a nice underlay for some of her other outfits. 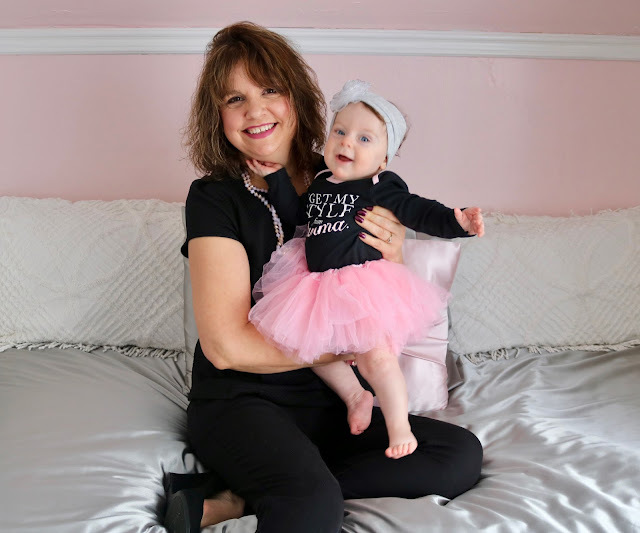 The baby tutu is from Amazon. I love this photo because the way she opened up her arms and swung her legs she looks like a ballerina dancing in mid air! What a perfect shot! The pearl necklace I picked up on our vacation to Myrtle Beach. It is a very long strand and can be worn multiple ways; tied in a knot, hung in a single loop, or wrapped twice around my neck and knotted like I'm wearing. I really love this old peplum top because it gives me the illusion of a waist line. I've gotten so much use out of it I went out and bought another one in white too! (check out these posts HERE and HERE). I'm very grateful we have a nice, new DSLR to take pictures of our beautiful granddaughter. Children are more relaxed and act more natural for the camera if they are in familiar surroundings with people they know behind the lens rather than taking them to a studio and having a stranger take their picture. We never would have gotten these cute photos in a studio! We can also take our time with the photo shoot and allow Alethea to relax and just be herself capturing priceless photographic moments like this one. Oh, I look at these photos and I can't wait to hold her again. Ashley posted a video of Alethea doing the "worm crawl" on Facebook the other day and I re posted it. I couldn't believe how much she changed in just a month! Her hair is fuller, curlier, and it looks like she might be a red head! My close friend described her hair color as "honey"; I thought that was a beautiful description! I will be leaving for Chicago at the end of February to spend a week with this precious little one and my other three "kids". I can hardly wait! Gorgeous photos, Amy and you look Super Granny Glam, love the outfits!! Hugs, x. Such sweetness all in one post, Amy!! How can your heart not be full with her smiles!! Thank you! 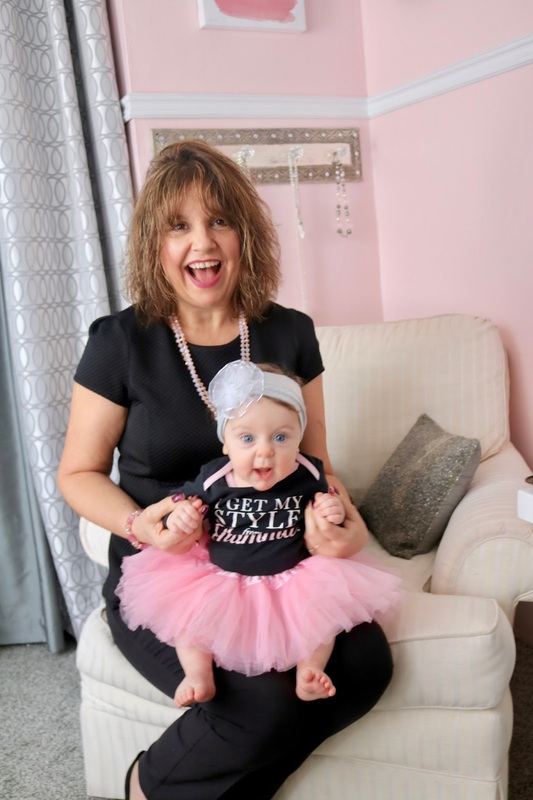 Just writing this post was pure joy...my heart was so full with love for her! These photos are so sweet! I love Alethea's tutu outfit!! Thank you Lauren! I always love your posts with your little girl too! She is SO, SO Pretty! 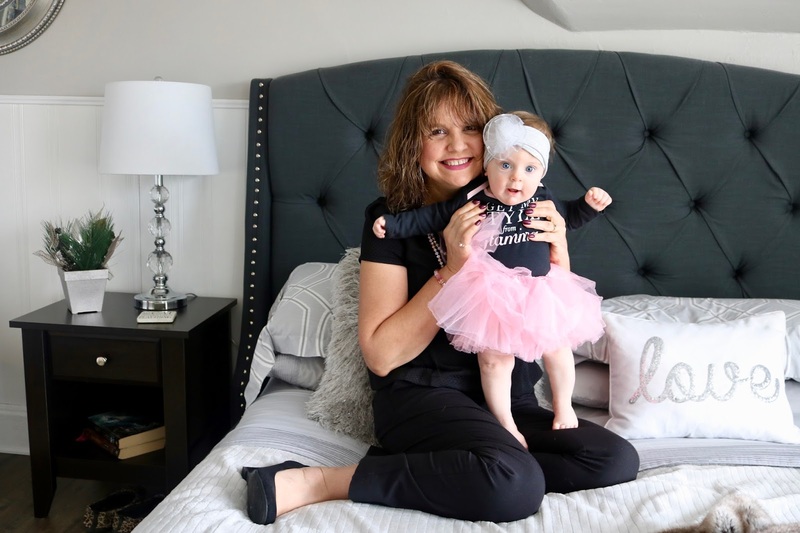 Thanks Patti, it is hard not to smile holding this little bundle of joy! AHH SO ADORABLE! Her big blue eyes are gorgeous. You look way too young to be a grandma! Love your perfect peplum top. Thanks Roxanne, those are the words every "Glamma" likes to hear! What a darling post! The colors in the outfits and rooms are so perfectly coordinated. Let's hope Alethea gives a nice toothy grin for the camera in February! Thank you! That's right, you said she's teething now! I can't wait to see her "toothy grin". I adore this series. Grinning from ear-to-ear over here. That baby girl is so bright-eyed and full of pizzazz. And you have the most adoring look on your face. Awww, thanks Leslie! I like your word "pizzazz". I couldn't agree more! Such adorable photos of you two! Loving her pretty tutu and what a perfect onesie for a photoshoot of you two! I agree buying for little girls is so much fun, my daughter is 11 now and I still like buying things for her more than for myself. Thank you Ellie! I look forward to spoiling her rotten with gorgeous clothes! Beautiful photos, Amy! I love the name Glamma! This is so beautiful. It must do your heart good to enjoy this beautiful little one and the fun you are having together. Your outfits are cool too. I am pinning this. Via Blogging Grandmothers :) You don't look old enough to qualify, keep up the good work. Thanks Kathleen! We do have so much together! And unfortunately, I am old enough but thanks for the compliment! I love to hear that! Omg what a cutie!! Love this and both of your outfits! Awww, thanks Shauna! Your so sweet! Oh Amy! This is fantastic! Your joy just radiates. And Alethea looks cute too. Thanks Nikki! I am filled with joy because of this precious little one! That onesie is so cute! I love it with the tutu! You are both darling together! I can't handle how cute this is! 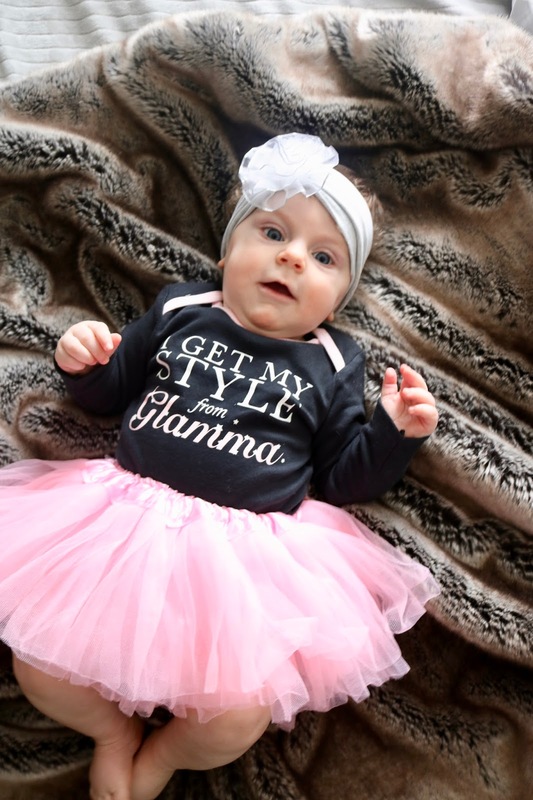 Since I had boys, I hope I get a granddaughter one day to dress up! Thanks Brooke! Hopefully you will! Oh Amy, she is BEAUTIFUL!!!! I LOVE everything abut this!! So overjoyed for your family!! With 3 boys, I hope someday I will have a granddaughter! What a blessing! You are the cutest Glamma!! Thanks Andrea, I hope you will too! How much fun you have with your granddaughter! She is adorable and I love the black and pink color combo! Thanks Ruth! I do have a blast with her, and I can't wait till she is older and we can even do more fun things together! Y'all are the cutest. The love between you two is so evident. Awww, thanks Carrie! I do love her so much! Oh my goodness, Alethea is the most precious girl!!! What a blessed Glamma you are!! Awww, thanks Elise! I am definitely blessed! 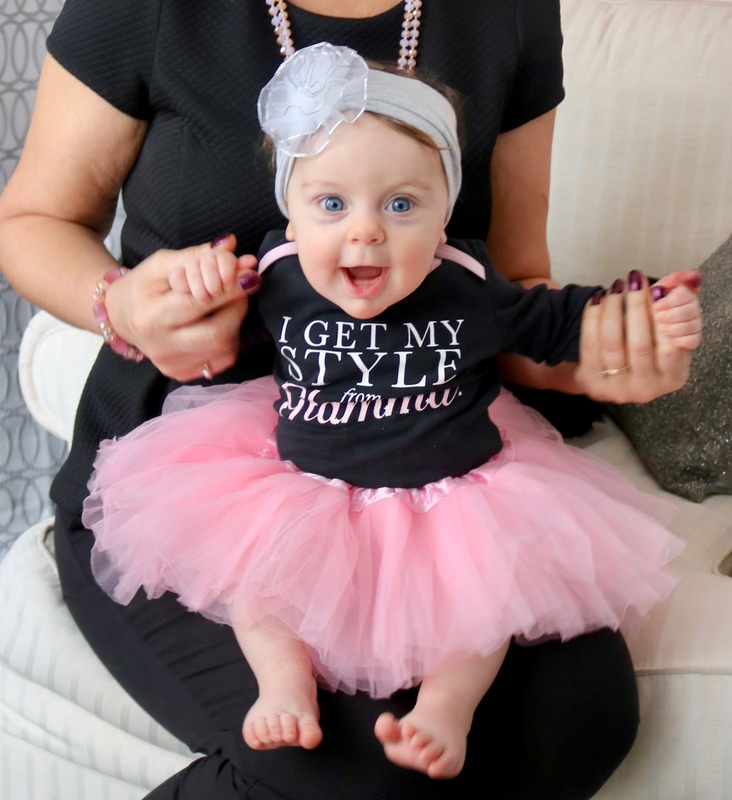 Oh, gosh... these are just the CUTEST Grandma and Granddaughter photos EVER!!! I just love them, the first one needs to be framed!! I also love BOTH of your outfits. That black peplum top looks lovely on you, I've been wanting to find a similar one in white or black! Thank you Carrie, you are so sweet! I did print and frame most of these pictures! I'm gonna run out of room in my house for spots to put all these pictures! What a precious grand baby! I would love to have a little girl in our family to shop for! For some reason, girl's clothes are just funner than boy's clothes, lol! I love that peplum top! It could go with so many things! Thanks for linking up! Thanks Julie! Girls are so fun to shop for. 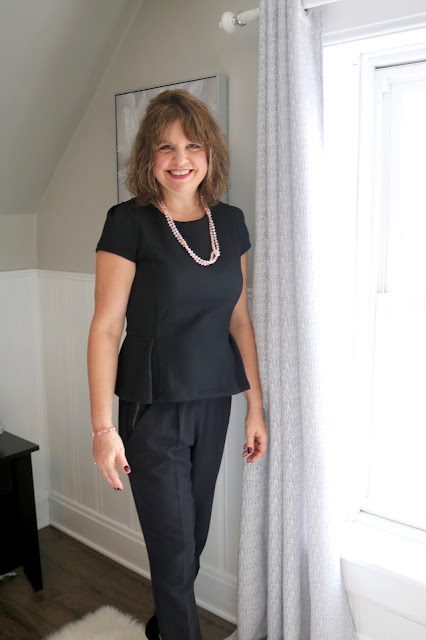 The peplum top is such a great piece! It will be in my closet forever! You are such a great grandma! Alethea is the cutest, and I love her outfit! And yours! Great photo shoot! Awww, thanks Andrea! I hope to be a great grandma! Soooo precious! You both are adorable in your matching Glamma and me looks. :) I can tell you are having so much fun shopping for Alethea. I am sure she is the best dressed baby around! Thanks for linking up with Fabulous Friday, Amy! Thanks Jennie! I am having so much fun and I intend to spoil her rotten! Alethea is adorable, such a cute outfit! I love your peplum top. I struggle to get them to fit me right, otherwise I'd wear them more. Thanks for linking up!